Previously I introduced my 10 principles for getting started on Twitter. Now I'd like to turn your attention to Facebook to share some practical tips I've picked up for the NGO, corporate or Social Enterprise brand manager. But first some thoughts on why I feel it's about time you got your social media act together in the first place. "Better stick to facsimiles and snail mail as we don't have the time to train our staff how to use these fancy electronic mailing systems. Surely that's a phase that'll pass." The benefits of using social media far outweigh those of not being there. And anyway, your brand is already discussed out there so you might as well get your version of it there too and try to harness the power of social networks for your NGO or business. If you're afraid of loosing control, well, you've lost that control long time ago. Your audience is also most likely anticipating that they'd be able to interact with your brand on Facebook et al. so you've got to ask yourself: "Am I trying to listen and understand the needs of my audience and be market-oriented — or not?" But the common counter argument goes "it's just another thing we would need to allocate staff time for". But hang on, weren't you saying that when email first came out? Ring a bell? What I'm trying to get across here that it's not just about "another additional thing"; it's the old thing about the way we communicate, interact and share stuff that's being changed due the new media called social media. So it's really about communicating and engaging effectively with your audience and various of stakeholders and that's what the NGO, Social Enterprise or corporation is or should be concerned about anyway, right? As for "allocating more staff time for an additional thing", the chances are that your staff is, as we speak, updating their Facebook status and 'poking' that colleague two desks away anyway while at work! You might as well put them to work over there. Heck, I bet they'd even enjoy looking after your Facebook fan base! Here's another news flash for the skeptics: social media is here to stay and NGOs, Social Enterprises or corporations will need to pick up the tricks of the trade sooner or later. If you're still not convinced, then check out this slideshow of interest especially for NGOs. Although a bit dated, still valid stuff and you can only add up to the figures presented. Social media offers a great way for bringing your brand closer to your audience — and vice versa. Not just Facebook, but the various other social networking sites (you should be out there especially on the ones your audience is using) enable you to gather your audience very conveniently in one location and create a forum through which you can interactive with people on a click of a mouse. But there's much more to it than just that; for example, just being seeing to be using Facebook et al. can help you transform your image too. If currently, for example, people see you as being distant, bureaucratic and old-fashioned, get active in social media which, by the very nature of the phenomena, enables you to get up, close and personal with your audience. And Voila! All of a sudden your stakeholders have seen a new side of your brand they thought never existed. It doesn't hurt anyone to be seen as being cool and hip! OK this wasn't supposed to be just a rant about why to use social media in general so let's get to the topic itself. While it's crucial for most of the organizations out there to start making the most of social media and tools such as Facebook, don't forget to do some thinking too. Here are my eight tips for getting started and having a successful campaign on Facebook. Around a year ago (or more) Facebook introduced a new feature called "Facebook pages". The pages are meant for organizations, companies or celebrities and offer a much better way of representing your brand than do the old Facebook groups. They receive more exposure too. Thanks to this newish page feature, your brand can now have a voice of its own. The problem with groups was that once the administrator posted a status update, it got posted by the admin person's own name whereas with the Facebook pages the status update or comment is seen as coming from the brand itself and the administrator can remain anonymous. A small but a significant improvement and does wonders for enabling your brand personality shine on its own! If you'd like to learn more about the differences between Facebook groups and pages, I suggest reading what Mashable's got to say about it in order to clarify things. And oh, bad news for those who had already created a group and have their fans over there: there's no way as of January 2010 still to convert a group into a page (if I'm wrong, feel free to correct me)...so a bit of extra work needed there in order to get your fan base across to your new page. Creating a page is dead simple: just go to Facebook and, instead of logging in, scan further below the page where it says something along the lines: "Create a page for a celeb, company or an organization". So go ahead and click that link over there and follow the easy steps to get started. The system will ask you to create a personal profile first unless you have one. However, if you are indeed brand new to Facebook, I'd suggest you get the hang of it first by creating and using your own profile before going out there to represent your brand! It's crucial to understand that the traditional advertising mindset doesn't apply on social media and might even end up damaging your brand. "It takes 20 years to build a brand and 140 characters to destroy it" read one comment someone had posted on the Guardian website I saw a while ago. So get signed up and have fun by socializing with your own friends first: make updates, comment your friends' updates, say 'like' / 'dislike' or poke at your best buddy (no explanation given on what these mean — go out there and figure it out! ), post links, share pics, update your own profile image, become a fan of your favourite celeb or the If One Million People Join We Will Move to Finland page (talk about a great solution for the population growth issue of Finland!). Once you've built enough awareness of the dynamics of sharing and engaging with your friends and the rest of the Facebook community, you may set up that page for your brand (though familiarize yourself with some of the case studies to follow first). So going back to that registration process we earlier started. It's all really straightforward but a word of caution: choose the name for your page very carefully as it can't be changed later on (at least as things currently stand on Facebook)! It would be a bit of a shame if you went ahead and launched your page only to discover, after having 100 fans, that you weren't happy with your page's name or, even worse, that there was a spelling mistake. I've seen it happen. So once you've got your page set up, add basic information including a clear description on what your page is all about. That's important so that those who see it know straight away what it's all about. Your profile image should also somehow tell the same story while the rest of your content, including your updates, should build up on the desired story. Remember it's about reflecting your brand personality. Add other content too like your own fan pages (yes, your brand's page can be a fan of another page — a nice way to make your brand personable) or some relevant images. You might even consider adding a YouTube application (there's a long list of apps available so find one that suits your purpose) or uploading your own videos. It's useful to study the following examples: Greenpeace and UNICEF. They both have nicely set up their pages and especially Greenpeace has a great tone of voice in-line of its brand values. But what's interesting to note is that the fans of Unicef are posting a majority of the updates on the page whereas on Greenpeace's page you don't see a single update by a fan — only comments to ones made by Greenpeace. Why is that? Are Greenpeace's 360,000+ fans just lazy? Hardly the case nor the possibility. It's down to the different privacy settings both have chosen to support their different strategies. 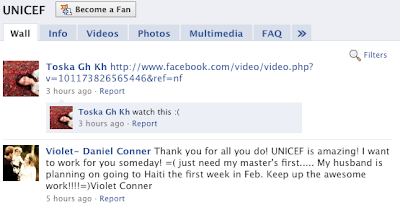 UNICEF prompts on its page to "Join us in telling the stories of the world's children". In other words, they actively want people to update the page with their own stories which goes on to explain the privacy setting that allows fans to freely post on the page. Once you've got your strategy in place with some nice content, you know what you want to achieve and how to go about it, go ahead and publish the page. Get started by word-of-mouth. Invite your pals and ask them to invite their respective pals. If you go about it the right way, a snow ball phenomena is bound to start. If you thought you could just create your Facebook page and wait for the magic to happen — think again for it takes time to build a fan base. And it's not enough just to have a fan base either; you should keep on engaging with your fans by posting relevant updates and fresh content (though don't go overboard so that you don't end up on the spam list!). If you don't have so much time to spend on it, you can always use the earlier introduced UNICEF strategy in case you don't have the resources for the more involved Greenpeace approach. Keep a close eye on what your audience responds to and get a grasp on what works and what doesn't. Remember you're supposed to try to understand your audience and identify the key opinion leaders. There's a great way of gathering some marketing intelligence at hand so don't waiste the opportunity. Remember that long gone are the days of one-way advertising; it's about having a conversation and having fun. So don't just always post an update saying "come to our website to donate" as that's going to wear people out. Instead think of your brand as someone with an actual personality. What music would your brand be into? What would it wear? What would it do on its free time? What blogs out there would it read? Those are all potential conversation starters. So get that conversation started and then you can occasionally post that update with a link to latest news on your homepage (which is still advisable mind you). 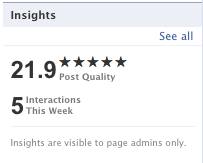 Make the most of Facebook's own statistical analysis tool as well. There are stats conveniently available from the left hand column of your page on country of origin, interactions made, retention rate etc. 6. So you are on Facebook — do you say so? What I imply by that questioning headline is that it's not enough just to be on Facebook — you should say you are on your own homepage too! I might be stating the obvious, but there are a surprising number of organizations or companies out there who, despite of having that page on Facebook (or e.g. Twitter), they fail to say so on their very own website. So add those links there and remember to advertise your page in every way appropriate. Facebook itself also offers commercial advertising solutions in case you're interested in more proactive marketing and have a few pennies to spare in your budget for it. You might also want to use some of the convenient Facebook widgets. While it seems there's always more and more networking sites to deal with, the good news is that the age of convergence is upon us: there's software out there, such as TweetDeck, that allows you to make a coordinated effort in managing your profiles on various of social media sites from Facebook to Twitter. But you don't even need to always use any third party software as your Facebook updates can become Tweets too and your Tweets can become Facebook updates if you so wish. While your at it, how about integrating it all with LinkedIn too? Not only that, but your updates can be posted to your website too. It's all about using the right sort of widgets. As you enter the new social media domain, it's important to establish some clear guidelines. Things to consider include what do you allow also your staff to do and say about you on Facebook, Twitter et al.? Are they allowed to represent your brand, and if so, how? You could go down the Manchester United route and enforce a ban or alternatively just establish very clear and easy to understand principles. Make sure everyone is on the same page, regardless of what your principles are as consistency is king. Yes, you do need to do a bit of training to make people understand the new dynamics of the new media. I'd also recommend you'd do some further reading too before you kick start your social media campaign reaching for the skies. Suggested reading include our own earlier blog post 10 principles on getting started on Twitter, the Social Marketing Playbook by 360i. Also the ever present Social Media Guide Mashable is worthy of a browse. Study also the best practices as well as cases where it's gone terribly wrong to get your head around things to do and things to avoid.